Agriculture in Kimana, Oloitoktok in Kajiado County is set to be revolutionized as small-scale farmers in the area are empowered on modern agribusiness through the Amiran Agribusiness Training Center, officially launched to the people of Kimana by the Kajiado County Governor, Honorable David Nkedianye. The Amiran Agribusiness Training Center will allow farmers at the community level to experience practical lessons on important agricultural practices such as nursery setting, transplanting and the introduction to various seed varieties after which the farmers will be able to differentiate between seed varieties either by color, size or growth period. Proper application of agro-chemicals and correct use of fertilizers, how to effectively use drip irrigation to increase yields as well as the benefits of using greenhouses, all will be emphasized in all training. Speaking at the function the Governor explained that killing agriculture had resulted in more poverty and joblessness in the area. He revealed that the Amiran training facility will help the people in the area to know how to work with field-proven technologies that are being used around the world. Sharing the same sentiments, Oloitoktok County Commissioner Harsama Kello expressed that Kajiado County is one of the country’s food baskets and by opening the Amiran Agribusiness Training Center, agriculture in the area will get a massive boost. Amiran’s training module that has to date been associated with the success of Amiran Farmers is a major motivating factor to the launch of the Amiran Agribusiness Training Center. 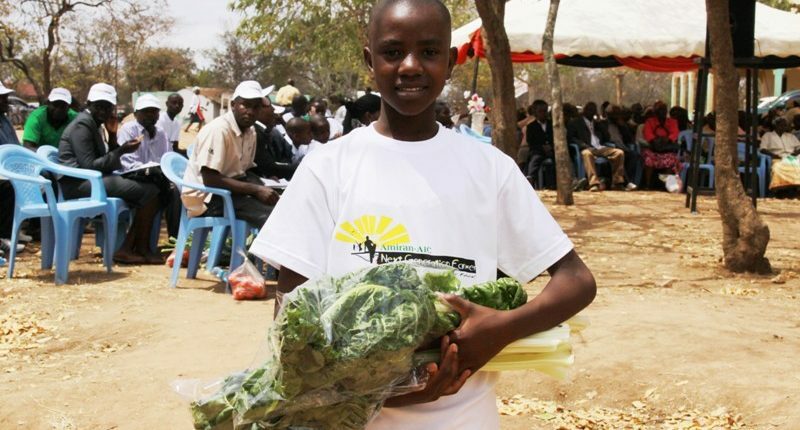 Amiran played a major role in the implementation of the Kenyans for Kenya Initiative, being tasked by the Kenya Red Cross Society (KRCS) to bring technologies and training to communities in areas hard-hit by the 2011 drought. Those same communities to date have undergone the Amiran training and are able to replicate what they learned at the farm level. Combining the training, high-quality inputs supplied by Amiran and a strong support system from Amiran Agronomists, the people who had experienced hunger due to the drought are currently able to grow their own produce for subsistence and commercialize the surplus. Through Amiran’s partnership with many other NGOs, Donor, and Government Ministries, this modern knowledge is today an integrated part of more than 1000 schools and being used by youth groups and women groups across the country. These groups have benefited from the training package and as a result, communities are upgrading and engaging in modern farming methods such as greenhouse farming and implementation of drip irrigation farming. Explaining the urgent need for better knowledge among farmers, Pinhas Moskovich Amiran’s Managing Director said that Kenya is sitting on the huge agricultural potential that will only be unlocked if information on modern farming techniques is made accessible to the public. Moskovich explained that most farms and farmers are located in rural areas thus the need to bring modern farming knowledge and techniques to the Kenyan farmers’ doorstep by establishing training centers among communities. Amiran’s efforts in the area of empowerment through sustainable agribusiness are in line with the famous quote: “Give a man a fish, you have fed him for today. Teach a man to fish, you have fed him for a lifetime”. Through such centers, Amiran plans to bolster agricultural production by developing agricultural education systems that will empower farmers in both rural and urban areas.